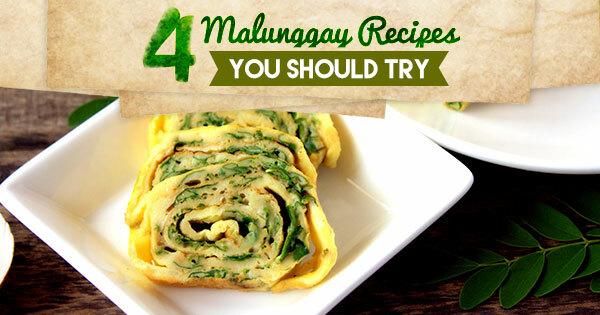 We understand that Malunggay—its taste and texture—may not be for everyone. But its nutrition and many health benefits are just too much to let pass! Give your Tinola and Munggo recipes a rest, because we’re serving you with other tasty ideas you can enjoy your Malunggay. Mornings are much healthier with a handful of chopped malunggay in your scrambled eggs, don’t you think? You might want to throw in tomatoes and some slices of cheese on the side for more flavor. Easy, right? More challenging and fun-to-do recipes are coming! Another option for a malunggay morning is biting into soft, freshly-baked rolls of bread made sweet with malunggay. Dissolve yeast and sugar in warm water. Let it stand for 10 minutes. Combine flour, sugar, salt, malunggay and butter in a large bowl. Add warm water, and yeast solution. Knead dough. Before transferring, grease your bowl with oil or butter. Cover your bowl with cling wrap and let dough rise. The longer you give it time to rise, the fluffier your rolls become. Redistribute yeast by punching down the dough, after a while of it rising. Flatten dough into a rectangular sheet and roll into a log, before letting it rest for another hour. Preheat oven at 180C. Cut and mold your dough into rolls. Rub each with bread crumbs before positioning them unto your baking tray, 2 inches apart. Bake rolls for 20 minutes or until they reach a lightly toasted color. Take out pandesal and let them rest on a cooling rack before serving. Infuse your favorite pasta sauce of garlic, some cashew, basil and extra virgin olive oil with a cluster of vitamins, minerals and a whole lot of nutrients. Use a food processor or a blender to combine all ingredients until smooth. Season with salt and pepper before mixing with your pasta. How can something so sinful be sinless? Focus on the patty. Mix ingredients, and mold a 4×1 inch thick patty. Grill on high heat and turn to other side after 6-8 minutes. Serve in heated burger buns with your choice of relish. You might be interested to check on these kid-friendly options as well.